Early Saturday morning, Lowell and I headed downtown. We grabbed some coffee and piroshkies from Pike Place Market. Then, wrapped up against the rain and cold, we stood around for a half an hour at West Lake Center. Why? 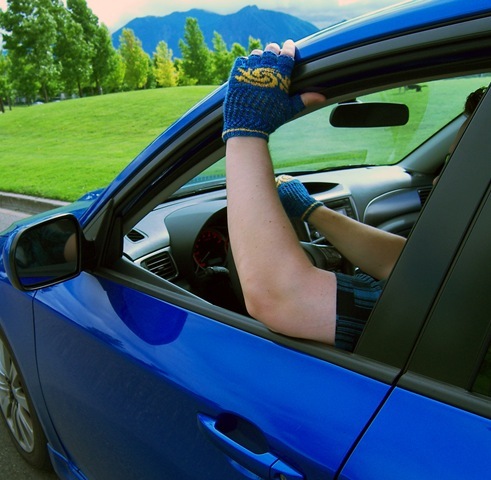 Because we’re very punctual (read: “unreasonably worried about parking”) people. We wanted to get a good spot at the Seattle satellite Rally to Restore Sanity and/or Fear. We did indeed get a good spot. The weather even started out nice enough for me to think that the long underwear had been overkill. (I was soon glad I had it.) 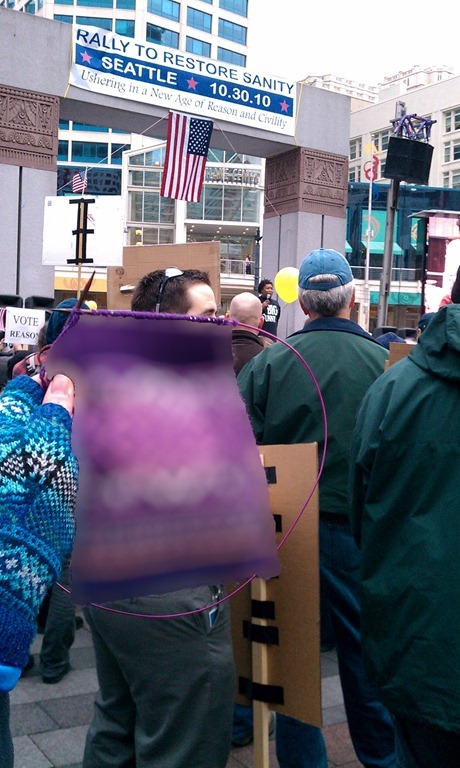 I had come prepared to the rally- no signs, no flag pin, but I did have a bag full of yarn! It wasn’t too cold- until the rain started. 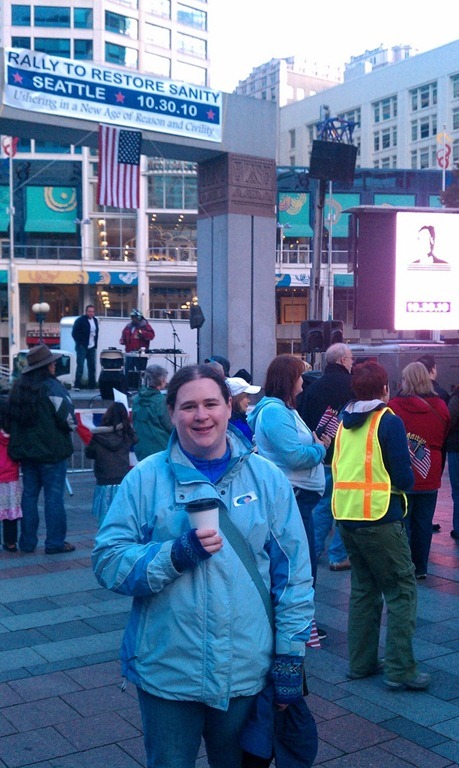 As the first comedian performing, David Crowe, said, “A rally at 9 am, outside, in Seattle, in October? What’s sane about that?” That’s when the long underwear seemed like a really good idea. 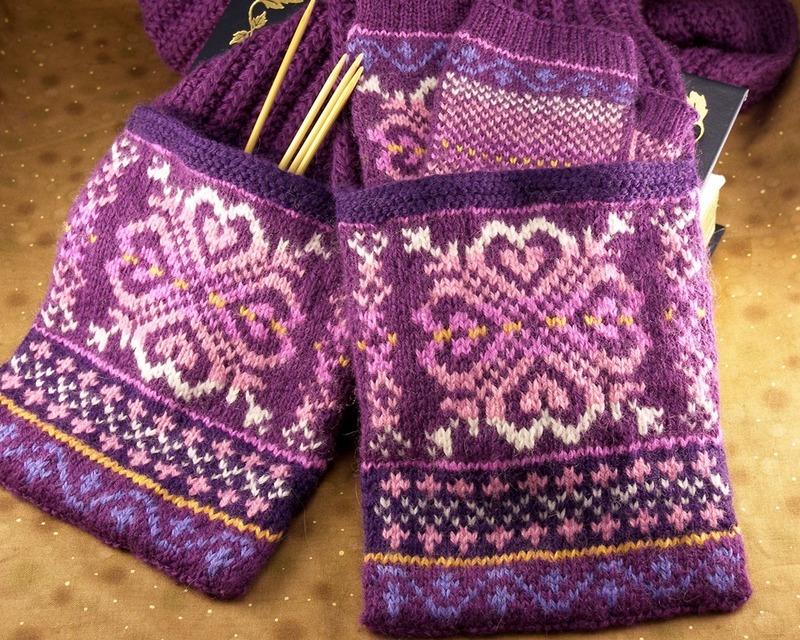 I put on my Snowflake Gloves and continued to knit. 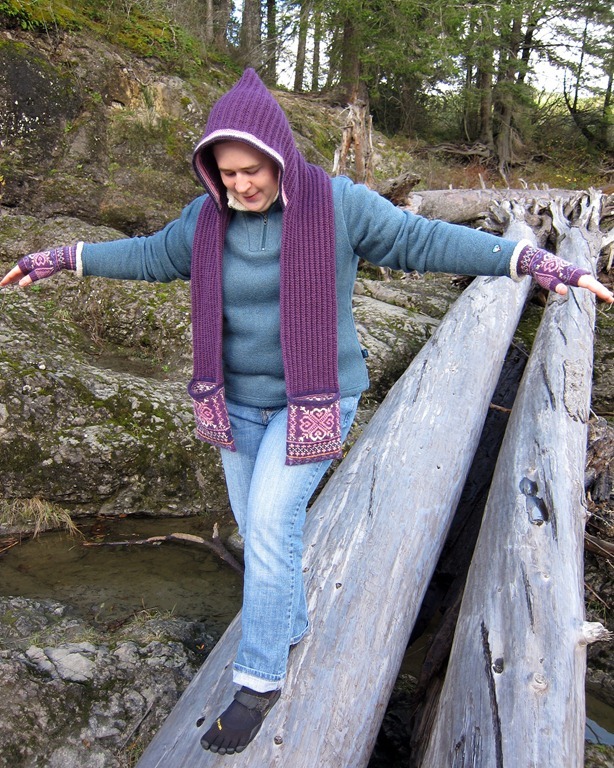 I was pretty surprised that I didn’t see anyone else with some knitting… but it was pretty cold and wet, so maybe that weeded out the mostly-sane among us. Things got more interesting when we were interviewed by one of the local TV stations, Q13. Now, usually I have a pretty good “I’m friendly, but not really interested in conversation” vibe going on when I’m out and about. I’m a shy person most of the time. But that morning I had a mini American flag stuck in my ponytail, I was grooving to the music, and I was knitting in the middle of the rain. What’s sane about that? The reporter pointed the camera and mike at me first, so I babbled something then threw the next question over to Lowell, who is normally better at these sorts of things. Apparently I speak more in soundbites, though, because she quickly thrust the camera back at me and asked me more questions. Luckily, after the first discombobulated answer, I was at least somewhat more composed for the follow-ups. You can’t see it in the video, but I was knitting the whole time I was being interviewed. Lowell is pretty sure that it was the knitting that made her come over, even though she didn’t ask about it, because later on, she snuck up behind me and filmed me knitting over my shoulder for about four minutes. Lowell nicely informed me of that when she was done. Sadly, none of the knitting made it into the final footage (then again, neither did my babbling), but I feel like I’ve tied this bit of fame back to the fiber arts enough to put it on the blog. 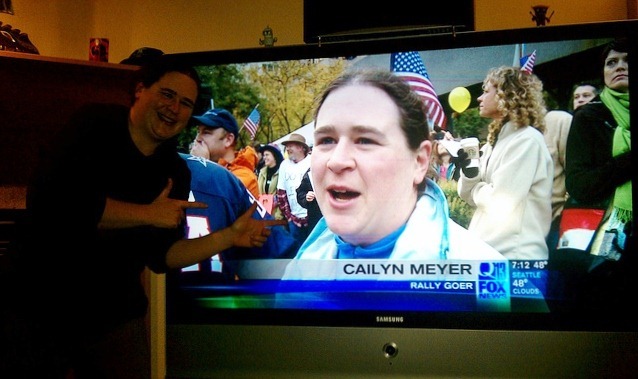 The funny part was that after the Q13 interview, we were approached by the “man on the street” interviewer. That one was live on the jumbo-tron. Lowell answered more than I did that time, but I did get to say something on the jumbo-tron. I’m not sure that it’s an achievement. Good thing that one hasn’t made it onto the internet yet! I think the knitting caught his eye too. Apparently the lesson is, if you don’t want to be interviewed on TV or for the jumbo-tron, knit discreetly. Ok, enough embarrassment. For now. 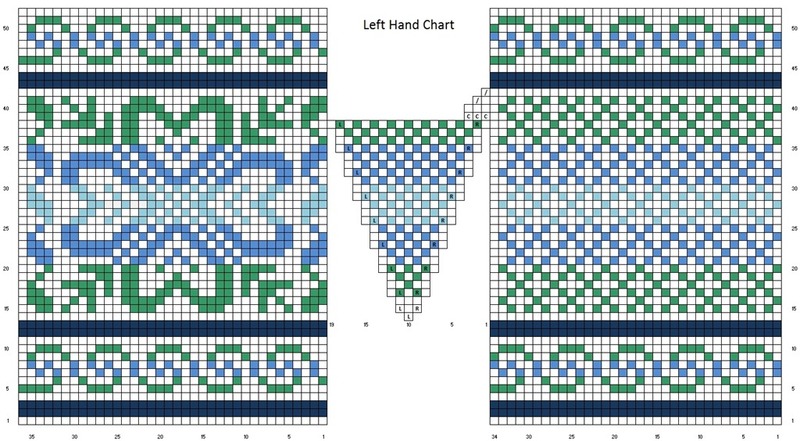 I started creating PDFs of all my patterns a few months ago. 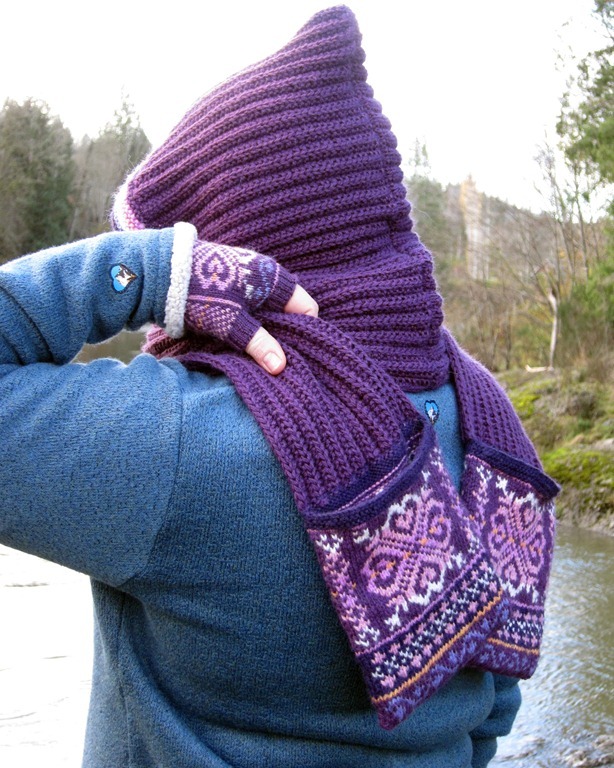 If you’re on Ravelry, you might have seen that you can download the PDFs from the pattern pages. But apparently I never put the PDFs on the blog! I’m not sure how that slipped my mind. It might be because my mind is slowly becoming a jelly-like substance that things only occasionally stick to. 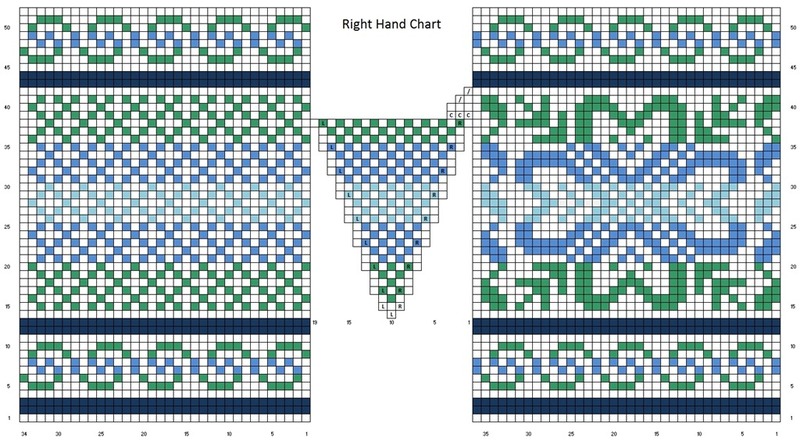 I don’t have all the patterns completed yet, but here is Round One, freshly uploaded onto the WordPress servers. Finished Size: Women’s medium/Men’s medium, circumference 7 1/2", length 5"; Men’s large, circumference 8 1/2", length 6"
M1R: Insert left needle tip into the strand between stitches from back to front and knit into the front of the loop. M1L: Insert left needle tip into the strand between stitches from front to back and knit into the back of the loop. Round 1: K1, *YO, ssk* over next 18  sts, k1. Using the Twisted German Cast On or the Long Tail Cast On, CO 40  sts. Distribute evenly between the needles. Round 1: *K1, p1* to end. Repeat Round 1 2 more times. Round 4: In CC, knit 1 round. (This keeps the “purl dots” of the other color from showing and makes the stripe look smoother). Round 5: *K1, p1* to end. Break CC. Round 6: In MC, knit 1 round. Round 7: *K1, p1* to end. Round 8: K20 , k1, M1L, k10, M1L, k1 to 1 st before the end of the round, M1L, k 1. 3 sts increased. 43  sts. Round 9: Work Round 1 of Mesh Pattern, then knit to the end of the round. Round 10: Work Round 2 of Mesh Pattern, then knit to the end of the round. Repeat Rounds 9-10 1  more times. Next round: Work next round of Mesh Pattern, place marker, M1R, k1, M1L, place marker, knit to the end of the round. Work 2 rounds even, working the Mesh Pattern as established. [Thumb increase round: Work Mesh Pattern to marker, slip marker, M1R, knit to next marker, M1L, slip marker, knit to the end of the round. 2 sts increased. Repeat instructions between brackets until there are 15  sts between the markers, ending after the second even round. Next round: K1, M1L, k18 , M1L, k1. Place all sts between the markers on scrap yarn or a stitch holder (markers can be removed now). CO 3 sts, rejoin round, and knit to the end of the round. 15  sts removed, 5 sts increased. 48  sts. Knit 24 , k1, M1L, knit to 1 before the end of the round, M1l, k1. 2 sts increased. 50  sts. Size L only: Work 1 round even. Size S: K13, M1L, k26, M1L, k13, M1L. 2 sts increased. 52 sts. Size L: K13, M1L, k13, M1L, k13, M1L, k13, M1L, k to end of round. 4 sts increased. 58 sts. 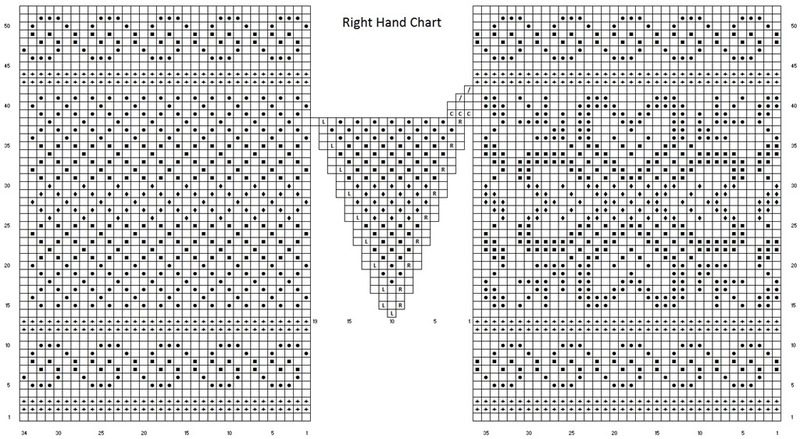 Both sizes: Join CC and work Right Swirl Chart for 15 rounds. The chart within the red lines repeats 3 times. Work the first 3 sts once, then the next 16 sts 3 times, then the last 3 sts once. Next round: K1, k2tog, k20 , k2tog, k2, k2tog, k20 , k2tog, k1. 4 sts decreased. 48  sts. Next round: K38 . 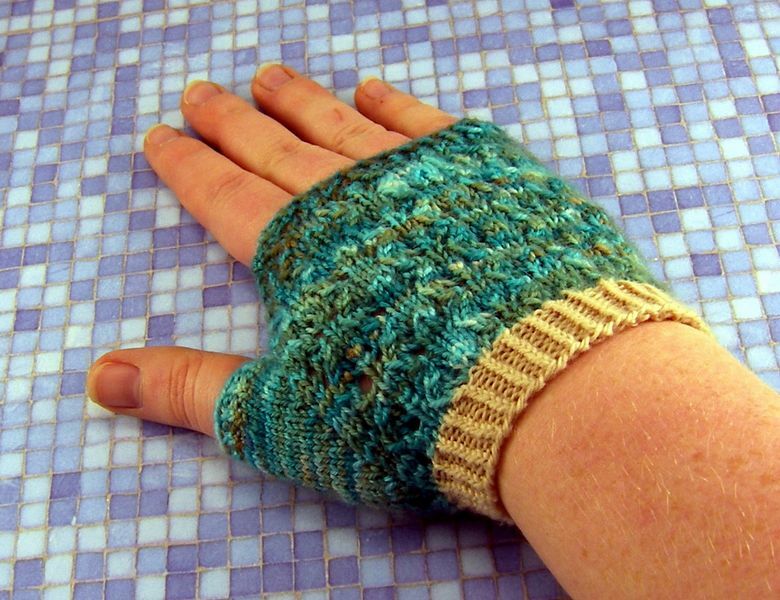 Place next 10  sts (the last 5  and the first5  of the round) on scrap yarn or a stitch holder for the pinky. CO 2 sts at the end of the round and rejoin in the round. 10  sts removed, 2 sts increased. 40  sts. K6, place the next 28  sts on scrap yarn or a stitch holder, CO 2  sts, k8 . 16  sts. Next round, S: *k1, p1* to the end. Bind off sts using EZ’s Sewn Bind Off. 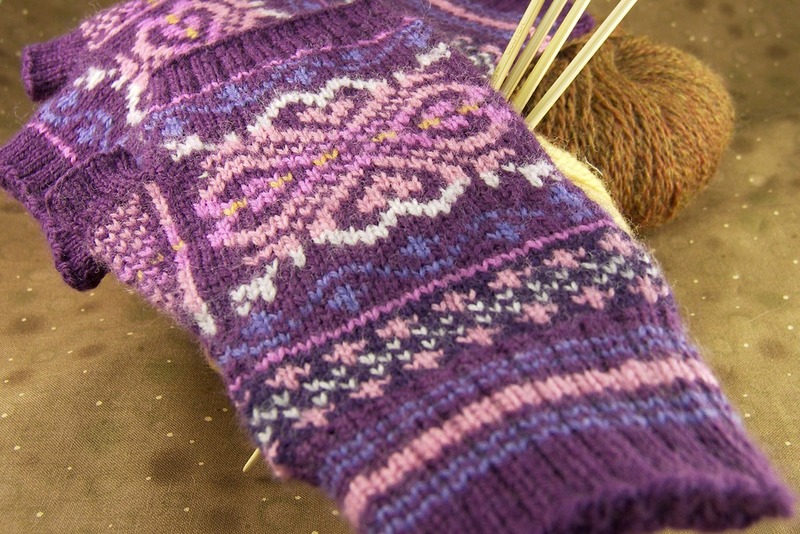 Return 7  sts from the back of the hand and 7  sts from the palm on the needles. Join yarn at the back of the hand and k7, CO 3  sts, k7, pick up and knit 4 sts along the cast on edge of the ring finger. 21  sts. Next round: K1, k2tog, k11, k2tog, k4. 2 sts decreased. 19 sts. Next round: *k1, p1* until 1 st before the end, k1. Return remaining sts to needles. Join yarn at the back of the hand and k12 , pick up and knit 4 sts along the cast on edge of the middle finger. 18  sts. Next round: K1, k2tog, k8 , k2tog, k4. 2 sts decreased. 16  sts. Next round, L: *k1, p1* until 1 st before the end, k1. Return pinky sts to needles. 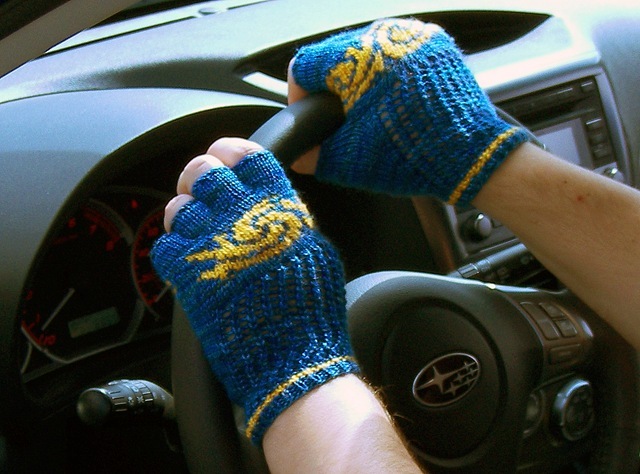 Join yarn at the palm side, k10 , pick up and knit 4 sts along the cast on edge of the ring finger. 14  sts. Next round: K1, k2tog, k4 , k2tog, k4. 2 sts decreased. 12  sts. Return thumb sts to the needles. 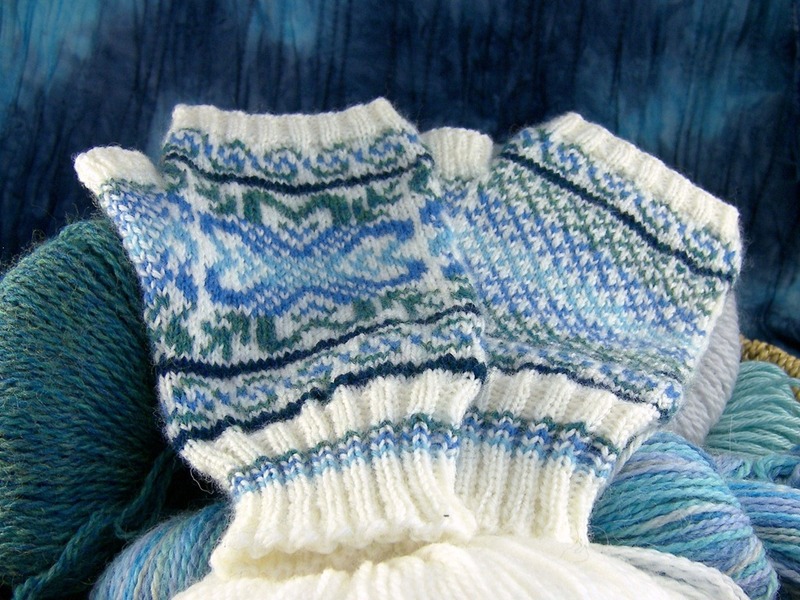 Join yarn and k15 , pick up and knit 5 sts along the cast on edge of the hand. 20  sts. Next round: *k1, p1* to the end. Work Cuff as for Right Glove. Round 8: K1, M1L, k8 , M1L, k8  M1L, k26 . 3 sts increased. 43  sts. Round 9: K 22 , then work Round 1 of Mesh Pattern. Round 10: K22 , then work Round 2 of Mesh Pattern. Next round: k21 , place marker, M1R, k1, M1L, place marker, work next round of Mesh Pattern. [Thumb increase round: Work Mesh Pattern to marker, slip marker, M1R, knit to next marker, M1L, slip marker, knit to the end of the round. 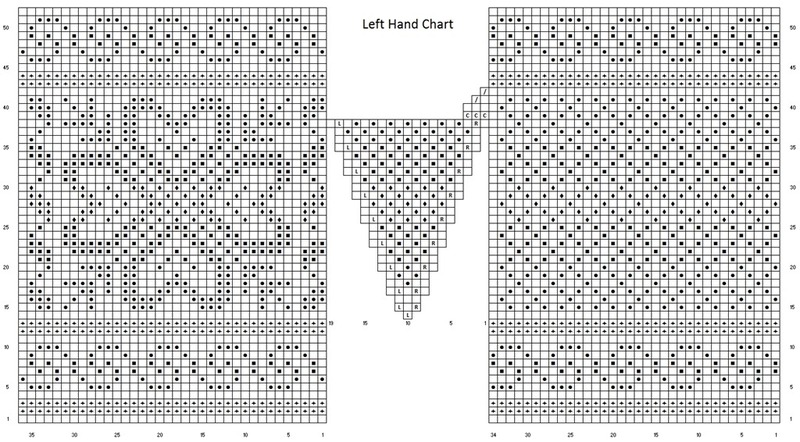 Both sizes: Join CC and work Left Swirl Chart for 15 rounds. The chart within the red lines repeats 3 times. Work the first 3 sts once, then the next 16 sts 3 times, then the last 3 sts once. Next round: K38 . Place next 10  sts (the last 5  and the first 5  of the round) on scrap yarn or a stitch holder for the pinky. CO 2 sts at the end of the round and rejoin in the round. 10  sts removed, 2 sts increased. 40  sts. Work the fingers and thumb for the left glove the same as for the right glove. Weave in all ends. 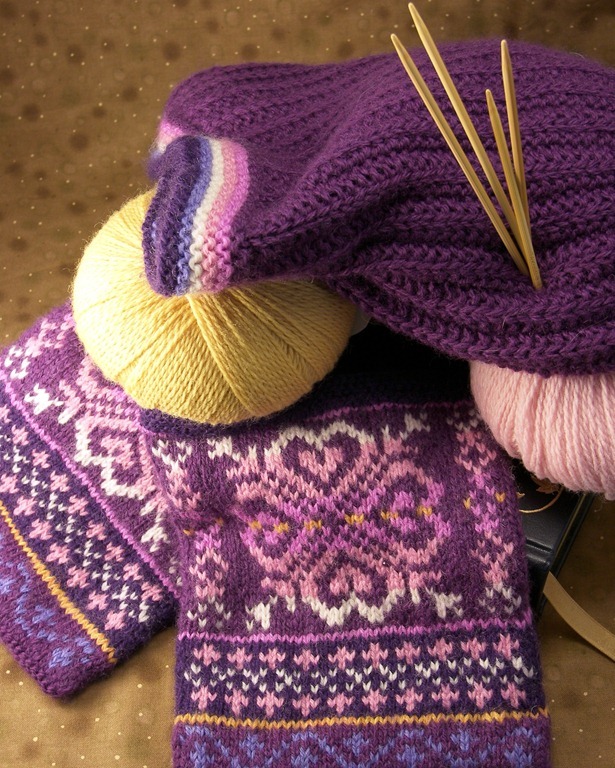 Use tails and/or left over yarn to conceal any holes around the base of the fingers. Lightly steam block if desired. There aren’t actually any rattlesnakes at Rattlesnake Lake, but the wind blowing through the trees makes a very similar sound to a rattlesnake and the original explorers thought there were snakes here. The water is a beautiful teal color when it’s sunny and there’s a nice rocky/sandy beach at the shore. 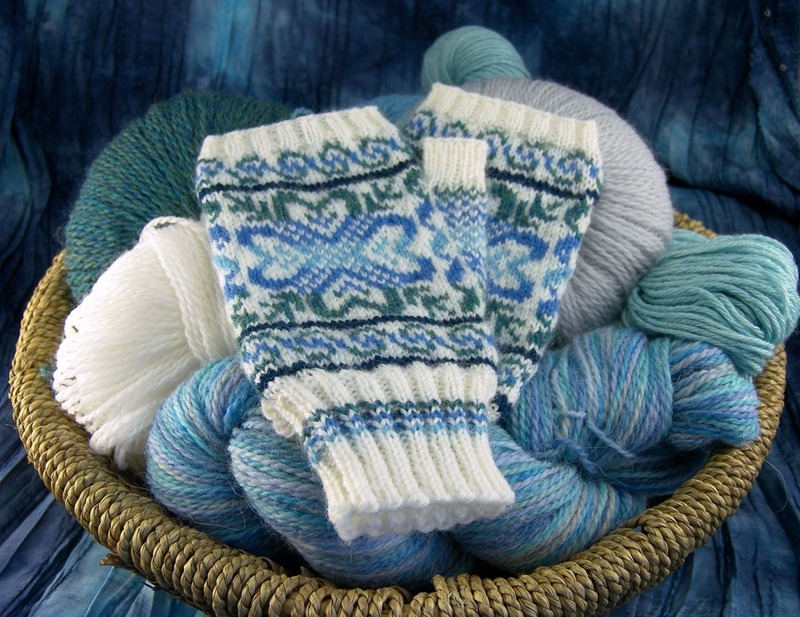 The Lakeside Mitts start with a 1×1 twisted rib, then have a fun and not-too-complicated lace pattern. The lace pattern is only on the back of the hand, so the palm is smooth and comfortable. 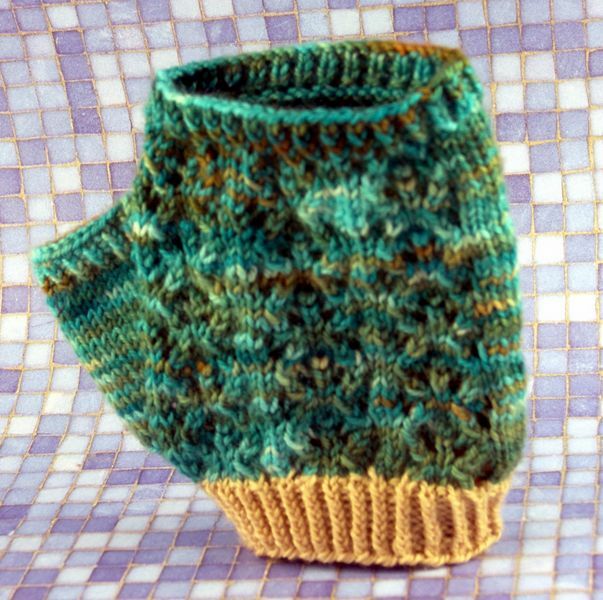 The thumb gusset is made with yarn overs and then bound off without having to join more yarn. 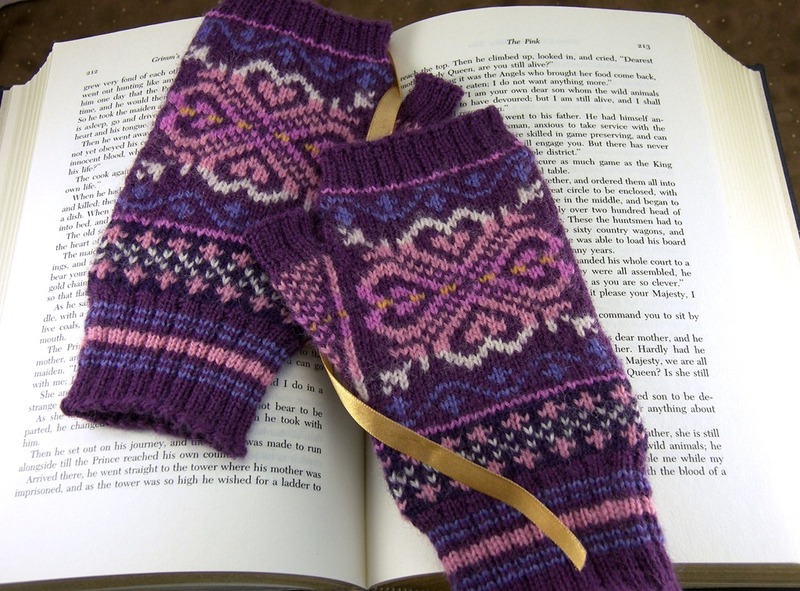 Except for the contrasting color cuff, the gloves are made in one piece. 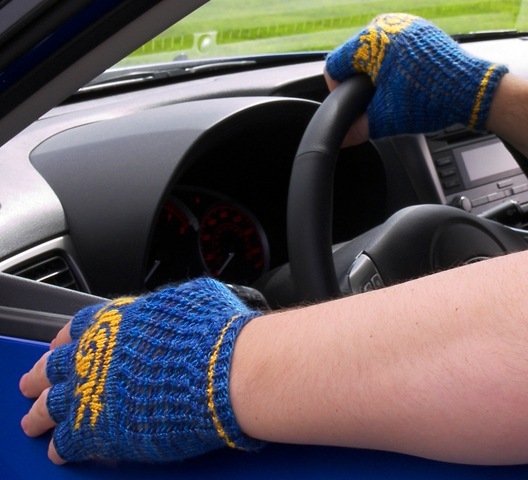 The right glove is made by knitting from the side of the hand towards the thumb over the back of the hand. 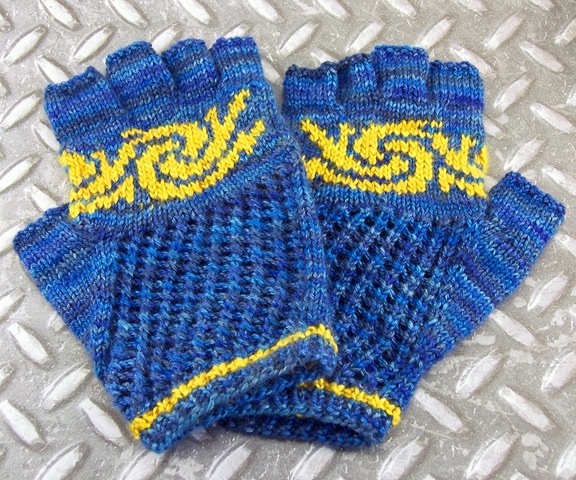 The left glove is made the opposite, by starting at the side of the hand, knitting across the palm, then over the back. The cuff instructions are the same for both. Twisted Rib: *K1tbl, p1* until the end of the round. M1: Insert right needle into the strand running between the stitches from front to back and place on left needle. 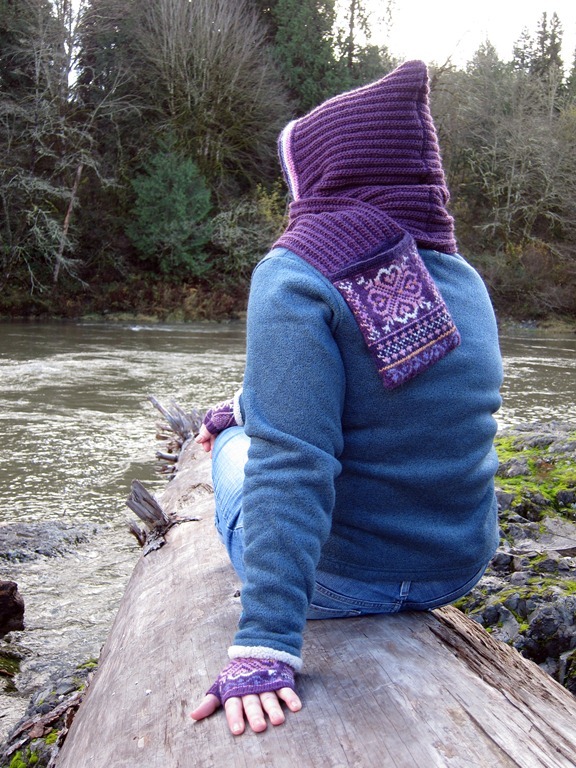 Knit into the back loop. 1 stitch increased. Pictures here. Work Twisted Rib for about 3/4″ or as long as desired. Round 1: Join MC and work the first row of Larkspur Lace over the first 29 sts, place one stitch marker, then p1, place second marker, m1, knit to 1 stitch before the end of the round, m1, p1. 2 stitches increased. 60 sts. Round 2 and all Even rounds: Work stitches as presented (knit the knits and purl the purls.) Counts as even rows for Larkspur Lace. Round 3: Work next odd row of Larkspur Lace to first marker, p1, k 30, p1. Round 5: Work next odd row of Larkspur Lace to first marker, slip marker, YO, p1, YO, slip second marker, k 30, p1. 2 sts increased. 62 sts. Round 7: Work next odd row of Larkspur Lace to first marker, slip marker, YO, knit to the purl stitch, p1, knit to second marker, YO, slip marker, k30, p1. 2 sts increased. 64 sts. Alternate Round 7 and an Even Round until there are 11 YO increases on each side. Rib Round: Work next odd row of Larkspur Lace to first marker, slip marker, *k1tbl, p1* to last stitch before marker, k1tbl, slip marker, k30, p1. Bind Off Round: Work next odd row of Larkspur Lace to first marker, slip marker, BO all stitches between markers, remove second marker, BO 1 more stitch, k30, p1. 59 sts. Work an Even Round, but CO 1 stitch after the marker. (Second marker can be removed now.) 1 stitch increased. 60 sts. 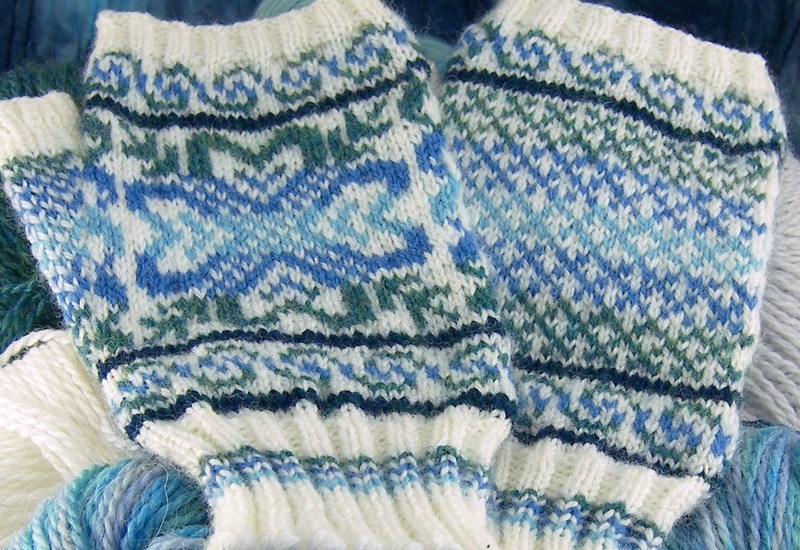 Alternate Round 3 and an Even Round until the gloves are about 1/2″ shorter than desired length. Work Twisted Rib for 1/2″ or longer. Round 1: Join MC and p1, m1, knit 27 sts, m1, place marker, p1, place second marker, work the first row of Larkspur Lace over the last 29 sts. 2 stitches increased. 60 sts. Round 3: P1, k 30, p1, work next odd row of Larkspur Lace to end of round. Round 5: P1, k30, slip marker, YO, p1, YO, slip second marker, work next odd row of Larkspur Lace to end of round. 2 sts increased. 62 sts. Round 7: P1, k30, slip marker, YO, knit to the purl stitch, p1, knit to second marker, YO, slip second marker, work next odd row of Larkspur Lace to end of round. 2 sts increased. 64 sts. Rib Round: P1, k30, slip marker, *k1tbl, p1* to last stitch before marker, k1tbl, slip marker, work next odd row of Larkspur Lace to end of round. Bind Off Round: P1, k30, BO all stitches between markers, remove second marker, BO 1 more stitch, work next odd row of Larkspur Lace end of round. 1 stitch decreased. 59 sts. Work an Even Round, but CO 1 stitch before the marker. (First marker can be removed now.) 1 stitch increased. 60 sts. Work Twisted Rib for at least 1/2″. 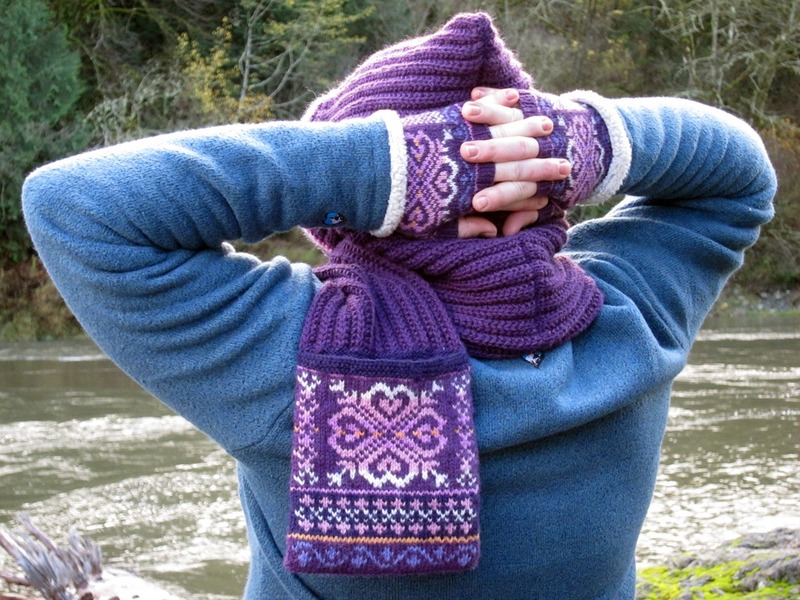 BO loosely, weave in ends and enjoy your new mitts! Last weekend was my birthday. It was a gorgeous weekend and we went kayaking down a section of river we hadn’t been down before. Everything was going great- this section has a lot of Class 2 rapids instead of our normal route which is mostly lazy with a few interesting bits. Personally, I think some parts of this section were Class 3. Anyway, long story short, I fell out of my kayak during some rapids. Got banged up a bit while scrambling for shore (that river moves fast when you’re on foot!) Of course, the Snoqualmie doesn’t always have a shore; often times it’s just a mass of brambles and thorns growing from a wall of dirt. The bruises are pretty impressive. Speaking of frogging, last Christmas at my in-laws, I was working on a hat. I didn’t really expect my radical hat design to work, but I kept chugging along. By the time the plane landed, I had ripped out the just the cast on 4 times! By Christmas Eve, I had half a hat done. Then I decided that it didn’t match what was in my head and frogged the whole darn thing (it had 4 colors, so it was quite the thing to frog.) Partly, I had a knitting project that was going to start on Christmas Day for Lowell and I didn’t want a half-finished hat sitting around. Well, my mother-in-law was shocked. She told her mother, “She was almost done with a hat… and then… she tore it all out!” (Lowell’s side of the family doesn’t craft much.) I frog a lot. I should get some sort of frogging trophy. “Best in Frogging” or “the Froggiest” maybe. I did manage to finish my project from my last post, or at least half of it. 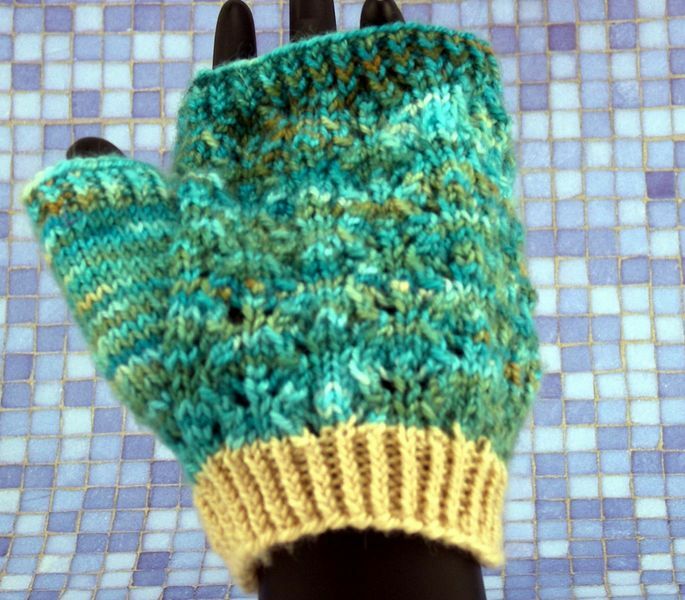 Cute, summery mitts for those times when it gets chilly in the evening or for wearing at the movies in the freezing AC or typing at the computer. (That’s where I’ll be wearing them!) 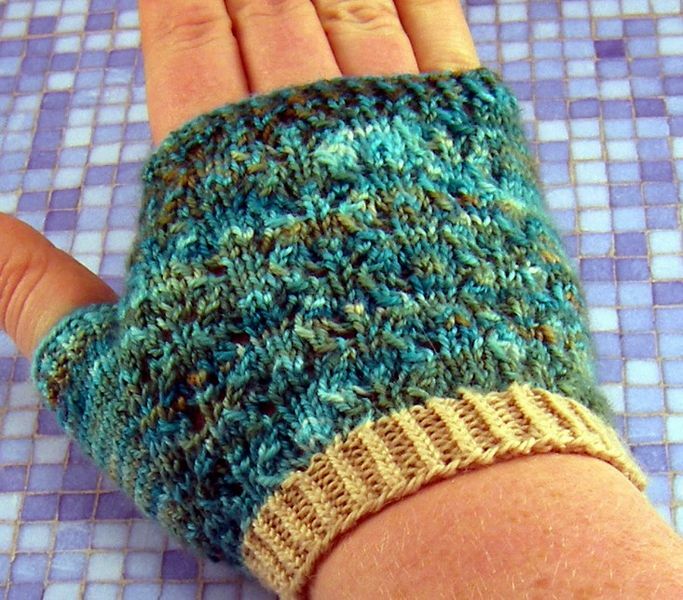 The Lakeside Mitts start with a twisted ribbing, have a pretty but fairly simple lace pattern on the top but a smooth palm for easy wearing. They’ve got a thumb gusset made with YOs and the thumb stitches are not held to work later, so the glove is all one piece. They use Pagewood Denali and Louet Gems Pearl. So soft, so very soft. 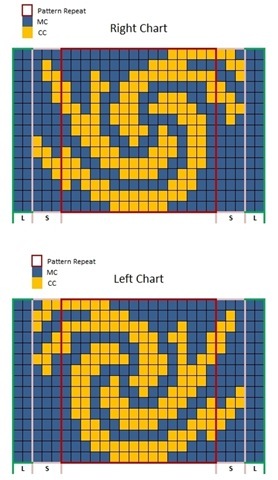 The pattern will be coming soon!